Restricting candy sends the message that candy is "bad". Kids are more likely to want things that are off-limits. By restricting candy, your child is more likely to overeat when it is allowed, and eat it behind your back when it is not. Try to remain neutral in your thoughts about candy and refrain from making comments about how unhealthy candy is. 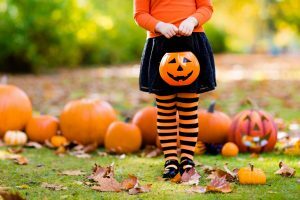 By allowing your children to eat their Halloween candy during meals and at snacktime, it places candy on the same playing field as other foods. This encourages the message that all foods fit. This also prevents your children from eating candy throughout the day, which may lead to them not being hungry come mealtime. When I give my children candy or other sweets, I usually serve it with a meal to reiterate the message that candy and sweets are not special. Almost always, my kids will eat the sweet stuff first (as I hide my cringe), but then they move on to the other food on their plate. Try to avoid negotiating with your children. "You can have the candy when you eat your vegetables" does not promote a food-neutral message. We are all born with the ability to self-regulate. As we get older and our view of food changes, and we tend to lose that ability. However, children are still very good at self-regulating, and will continue to be as long as they learn that all foods are acceptable. Talk to your kids about eating until they are satisfied. If they know they can eat candy at another meal, they will be less likely to overeat candy. When your child eats until they have a stomachache, use that moment to tell them in a matter of fact way that they probably ate too much. If your child can't finish something, tell them they can have it later, and follow through with that promise.